A scene from the upcoming "Mission: Impossible 5"
Amid the recognizable rubble still littering Earth’s dystopian hellscape in 2077, what also manages to survive humankind’s war against alien invaders are plenty of science-fiction movie cues to populate director Joseph Kosinski’s Oblivion. While such homage is usually cause for fanboy freneticism, in this case it actually distracts from an otherwise sci-fi stemwinder. Six decades prior, invading aliens called Scavengers (Scavs, for short) shattered the Moon, inflicting all manner of cataclysmic destruction. When humans were forced to use nukes to beat back the extraterrestrials, the planet was left a barren wasteland unable to sustain life. Humankind fled to the Saturn moon Titan, leaving behind a small band of techs tasked with maintenancing giant rigs extracting any remaining subterranean water, along with stamping out any Scavs still lurking about. Tech 49 is Jack Harper (Tom Cruise), who together with his dutiful communications officer and lover Victoria (Andrea Riseborough), form “an effective team” in service of their off-planet commander, Sally (Melissa Leo). Jack and Victoria live atop a Frank Lloyd Wright tower in the clouds, with Jack flying a pod-like aircraft below to complete his missions. They are aided by airborne “drones” controlled remotely by Sally, each powerfully weaponized and equipped with HAL’s dead red eye. Between making his daily rounds and nocturnal skinny-dipping with Vicka, Jack explores the ruins of sports stadiums, pilfers books from the razed New York Public Library and constructs a getaway shack near an unspoiled oasis stocked with such artifacts a Yankees cap, sunglasses and a vinyl record collection (apparently CD players didn’t survive the radiation). Jack also suffers recurring flashbacks of meeting a woman on the observation deck of the pre-war Empire State Building. Matters become more complicated when that woman, Julia (Olga Kurylenko), crash-lands to Earth in a derelict NASA spaceship with the rest of her hibernating crew. A drone destroys all but Julia, who Jack rescues and awakens. What follows a slow revelation of Oblivion’s secrets, including the appearance of a battered band of refugees led by Beech (Morgan Freeman), who takes an interest in Jack after seeing him thumb through Horatius in Lord Macaulay’s Lays of Ancient Rome. Subtexts aside, Tom engages Cruise control, conveying his typical determined daredevil persona, for better and worst. But if you dig deep enough, there’s also a critique about the cookie-cutter action characters Cruise and others have portrayed throughout their acting careers. While Riseborough proves worthy of her emotionally complex role, Kurylenko is woefully one-note. Freeman contributes little besides Morgan Freeman’s Voice™, but heck, do you really need anything else? The stunning visuals and bombastic soundtrack (which sounds like a fusion of Daft Punk and Hans Zimmer) to Oblivion owe much to Kosinski’s first feature, Tron: Legacy. Indeed, the exquisite art design and special effects alone merit the full IMAX viewing (and ticket price). But, the influences hardly end there. The film borrows heavily from such 1970s sci-fi standards as 2001, Silent Running, The Omega Man, Planet of the Apes, Star Wars, and Andrei Tarkovsky’s Solaris. There are also plentiful references to recent genre entries like The Matrix, Moon, and WALL-E. (TOM-E, perhaps?). All this aping would normally expose Oblivion to being damned as derivative. 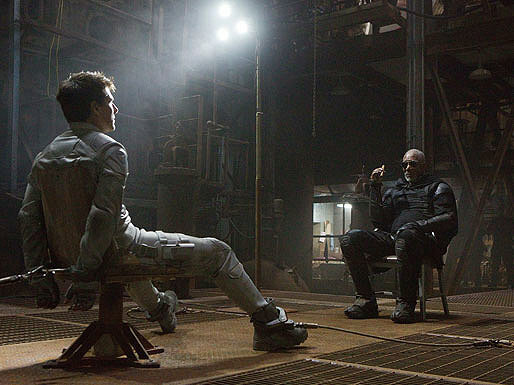 But, the unique template produced by Kosinski and cinematographer Claudio Miranda—who won an Oscar for Life of Pi—helps save the film from cinematic, well, oblivion.